IF YOU FLEW across South London, Kent and Surrey in the mid-1970s, you would have looked down on acres of sports grounds comprising rugby, football and hockey pitches. Many of these grounds, with their excellent facilities and perpetual odour of horse liniment, were owned by banks, insurance companies and old boy networks. National Westminster Bank had two fine sports grounds, at Norbury and Lower Syndenham. All the major banks had their own similar temples devoted to fresh air and exercise – Midland had one almost opposite NWB (no NatWest in those days) in Lower Sydenham, and the Bank of England’s ground at Roehampton was legendary among such venues. It was not quite the paternal hand of Cadbury’s or Port Sunlight, but NatWest and other banks made an effort to encourage the right type of bank employees. What splendid places they were. Very heavy on rugby, admittedly, but NatWest also had a battalion of footballers turning out on a Saturday afternoon – the blues, playing in a white shirt with dark and light blue stripes across the midriff. The teams would play in those laudable amateur leagues that mostly comprised clubs from the southern home counties or London. You would get a call from the Sports Department’s team selection office on a Thursday, asking you to turn up at a location in Mottingham, Catford, Beckenham, or indeed, Norbury or Lower Sydenham and report to the team captain. For me, it was my first sortie “south of the river”. Names I had never heard of – Chislehurst, Sittingbourne, Bat & Ball, East Dulwich, Selhurst and Petts Wood. Often, I would bump into unruly packs of Millwall, Crystal Palace and Charlton Athletic fans, but you could also identify a sportsman bound for one of the bank sports grounds. Given these teams – ranging from the first XI that would often include decent non-league players to the rag-bag 15th XI – often comprised different players every week, there was no continuity in most of the line-ups. The first team played in the Southern Amateur League, which was a high standard in those days. Essentially, though, the game was played for the sake of it, handshakes and back-slaps all round. I remember scoring my first goal for the 10th XI in the shadow of the Crystal Palace TV aerial, and also receiving a black eye after heading a last minute goal against a team of London lawyers at Lower Sydenham. I was 17 at the time, lacking in physique and often muscled out of the action by gnarled old FX traders who seemed to have forgotten they were not playing rugby. 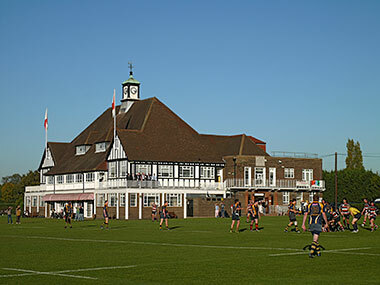 After the game, the teams would retire to the local pub or, if the fixture was at a NatWest ground, head for the pavilion where all the teams from various sports would congregate. The refectory would be full of players eating their post-match meal of sausage and mash or pie and beans, and large plastic jugs of ale would flow all evening. Bonhomie filled the air, but you rarely saw a woman, unless, of course, they were serving your meal. There was, at more than one sports ground, a “men only” bar! If only we knew it, but these were halcyon days for the corporate sportsman. The pitches and dressing rooms were outstanding and the code of conduct drawn from another age. The air of the Corinthian – with a hint of public school ambience – prevailed, and you were expected to behave in the bar and “act like gentlemen”. NatWest sold off some, or maybe all, of its sports grounds as the bank lost its cachet and purpose. And with that, some of the heart and soul of the organisation was transferred to the balance sheet! My grandfather (Bowman), father (Ronald Bartlett), mother, aunts and uncles all played hockey, cricket and rugby for NWB at Norbury. My mother (aged 90) has many team photos and wondered if there was anywhere that would be interested in these old photos? I run a facebook group called Norbury Photographs, we would love to see any old photos you may have of NWB at Norbury. I’m afraid, I don’t have any. Sorry! Brilliant. You have summed up more than a memory, you’ve captured the feeling we all felt every Saturday afternoon. And those jugs of beer, never an empty glass. I first played there in 1979 and was agrieved I couldn’t quite get 4 pints of beer for my pound at 26p a pint!! Cut off too soon. Old Westminster Citizens, Old stationers Old Parms, Just to name a few. They were great days never to be seen again. Just glad that I was there to witness it all. Not forgetting Old Parkonians (Old Parks) where the after match meal for away sides was a bowl of soup and a hard boiled egg, but it was a tradition. Joined one of Nat West’s City branches (1 Princes Street) in 1974. They weren’t great payers but otherwise certainly knew how to look after their staff. Nat West bars, Nat West restaurants, yes – the sports grounds, and that very fine college down in Oxfordshire where I spent 4 days on an induction course (originally a stately home, now a very upmarket hotel and conference centre). As I understand things, it’s all gone now, and for many years. Alcohol-free lunches, luncheon vouchers, and burgeoning waistlines. Wiped out the entire middle-management in the eighties. I think my few years there was the very best for Nat West in terms of employee relations, and also ‘twilights last gleaming’ for the integrity of banking in general. I worked at IWB from 1975 to 1979. My Dad, Alan Moody, was the Lloyds Bank 1st XI goalkeeper in the 1950s/60s. I have fond memories of going to the ground in Copers Cope Road, Beckenham to watch them play (often standing on duckboards on the touch line during the winter months). They won the AFA Senior Cup in 1961 beating Old Monovians 5-4 at Motspur Park. Dad was still playing tennis until a year ago with a dwindling bunch of diehards at the HSBC ground when he decided it might be prudent to call it a day at the age of 88!